The Mediterranean region is one of the hottest destinations for travel, with tourists far and wide. Offering cultural diversity alongside a unique mixture of beautiful coastline, pleasant climate, several cultures and rich history, the Mediterranean in fact gains most of its income from tourism alone. The Azamara club cruises carry vast multitude of tourists every year on an experience of a lifetime that is the Mediterranean cruise. Loaded with world-class infrastructure and amenities, Celebrity Edge is another highly popular cruise ship with the Mediterranean among its destinations. It is good to be aware of the climate of all the places you are travelling to, in order to pack clothes accordingly. One thing that people know about the Mediterranean climate is that it is mostly hot. However, when you are one a cruise ship, the weather can get a little chilly, especially during nights. So, you can begin with packing some tank tops, tees, shorts and comfortable trousers for the day. Men can likewise pack t-shirts, polo shirts, shorts or trousers. For the evenings, a sundress or skirt and teewill work well for women. It is also advised that you check if there is a dress code to be followed in your cruise ship, as some expect guests to put formal wear for the evenings. Since you will be cruising in the Mediterranean, all the ports that you will stop at will inherently have beaches. It will therefore be a good idea to include swimming suits in your luggage, if you plan on indulging in any water sport or even swimming. If you are travelling during the shoulder season, it will probably be a good idea to carry a rain jacket that will keep you both dry and warm. 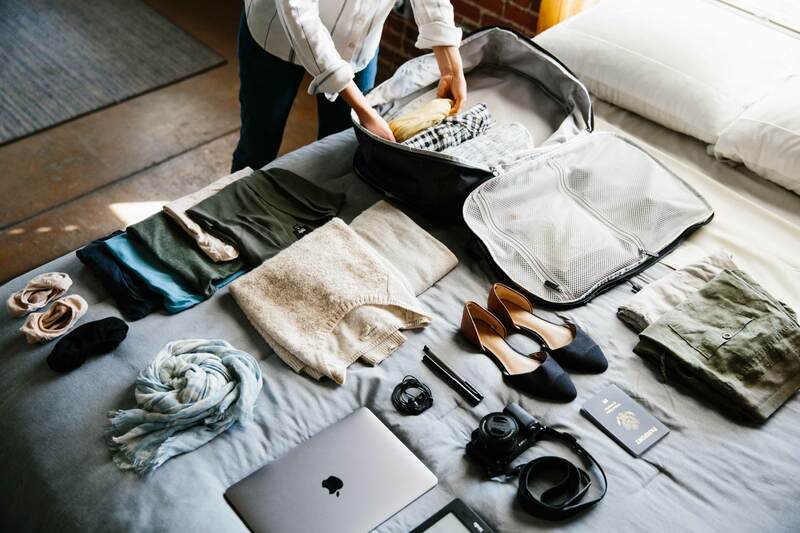 Once you are done with outfits, the next key thing in your list should be accessories, and there are quite a few important ones that you must include in your luggage. Carrying a scarf for instance, can be of great use to you. This valuable item will not only protect you during chilly mornings and hot afternoons, but also passes for a headgear in countries that have such a dress code. A hat can also be a good item to carry, as it can be quite windy when you are on deck. Some other key accessories to include in your bag are – a pair of sunglasses, a small and compact umbrella and some comfortable footwear. Both men and women can pack in three pairs of footwear if not more, including – a pair of flip-flops, heels/formal shoes and a pair of converse or running shoes for rough terrains. Next, make sure you have a side bag/purse or a beach bag big enough to fit in some essentials when you are out to explore. Last but not the least, toiletries especially when you are travelling to a foreign countrycould prove life-saving at times, hence must not be forgotten. To travel comfortably in the Mediterranean region without getting sunburned, make sure you have a tube of sunscreen with enough SPF in it. Next come medications.Whether or not it is your first-time on a cruise, do carry some sea-sickness pills or some motion-sickness aids like acupressure wrist bands, behind-the-ear patches or whatever works for you. These will help ensure that you do not spend your cruise trip feeling queasy all the time. You could also pack in some conditioner, toothpaste, perfume or any other toiletry that your cruise ship does not provide. Apart from the above, anything else that you wish to carry is optional, for instance make-up kit for the ladies. Cameras, iPodand books are also among the additionalitems that people like to carry to keep themselves amused while on a cruise. In the end, make sure that when you pack your luggage, you do it in a manner that enables you to unpack easily too. Also keep in mind that you pack them all in a sturdy suitcase or one that does not trouble you with packing. Bon voyage!